The MEC Marksman is an outstanding single stage press — very strong, with convenient open front and a patent-pending self-centering shell holder (that can improve loading consistency). Right now, with discount CODE “NCS”, you can get this beefy USA-made Marksman from Brownells for just $164.99, including FREE Shipping. That’s a bargain — this press sells elsewhere for up to $208.00. The MEC Marksman has strong, cast-iron construction and offers plenty of leverage. It is compatible with all 7/8-14 thread dies, so you can reload from .22 Hornet to .416 Rigby. If you are looking for a premium single-stage press you won’t be disappointed. Act soon as this Brownells discount offer may expire soon. The rifle action is the cornerstone of accuracy in any rifle build. If you don’t start with a strong precision made action then all your other money will be wasted. That’s why so many people choose Kelbly Actions. They’re make the most rugged action possible for practical, tactical, or hunting. Using a Black Nitride finish from H & M Metal Processing. 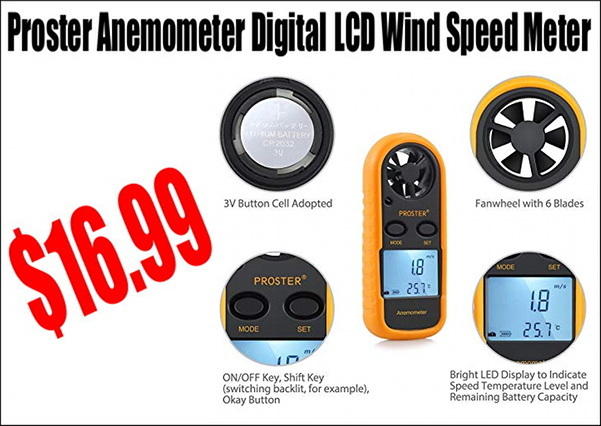 This allows you to use this action “dry” or without lubrication for extreme environments. In addition to the Black Nitride process they use a fluted bolt, to help move dirt into the flutes allowing better function of the action. 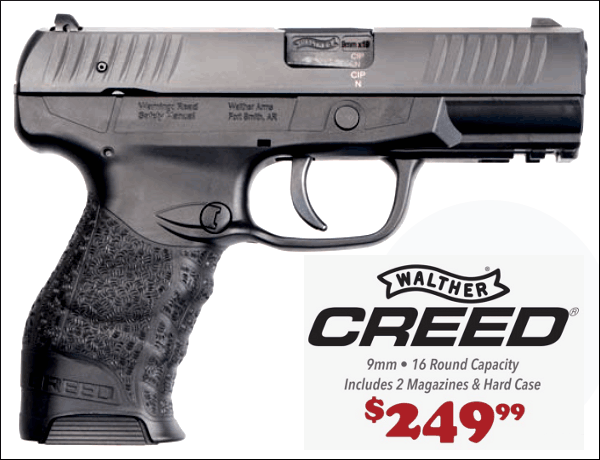 Magazine wells use the Accuracy International single stack magazines. Another key feature of this action is the TG ejector, it is a mechanical ejector that does not put any chamber pressure on the round. It is also a “never fail” setup, meaning that there are no springs to get gummed up and stop working. 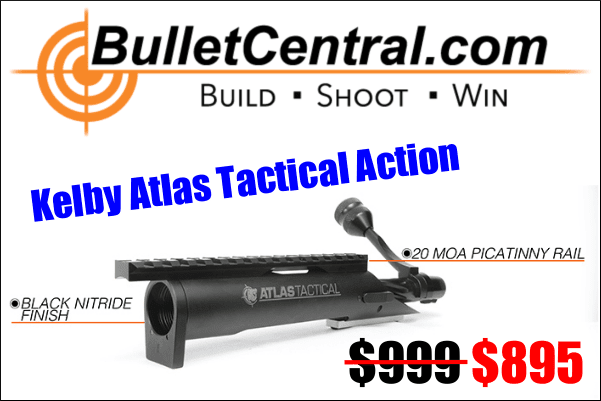 Actions rarely go on sale which is why we couldn’t resist highlighting this Kelby Atlas Tactical Action over at Bullet Central for the low price of $895.00. The days of .22 LR shortages are over, and now there is ample supply of rimfire ammo at reasonable prices, and the ammo-maker are even offering REBATES. Right now, Midsouth Shooters Supply has a great selection of CCI 22LR, 17 HMR, and 2 WMR Rimfire Ammo. 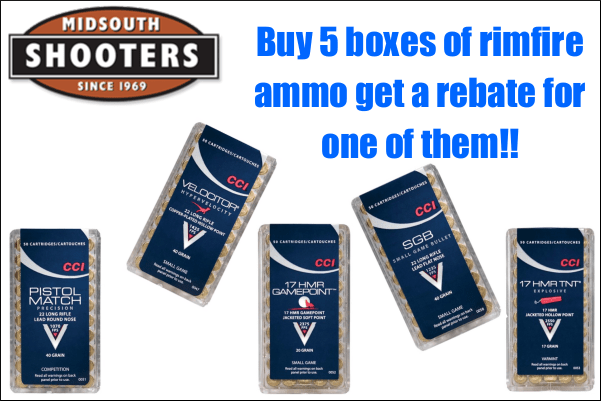 Plus, for every five boxes of CCI rimfire ammo you buy, you get a rebate for the value of one box. That basically works out to buy 4 get 1 free. The limit is $200.00 in rebates per household. CLICK HERE for the CCI Rimfire Rebate Program. Finding the right tools to work on your guns, scopes, rings and other items can often be frustrating. Regular tools from the hardware store work in a pinch but often aren’t hollow ground to protect your screws and the sizes are rarely correct for the firearms parts we work on. 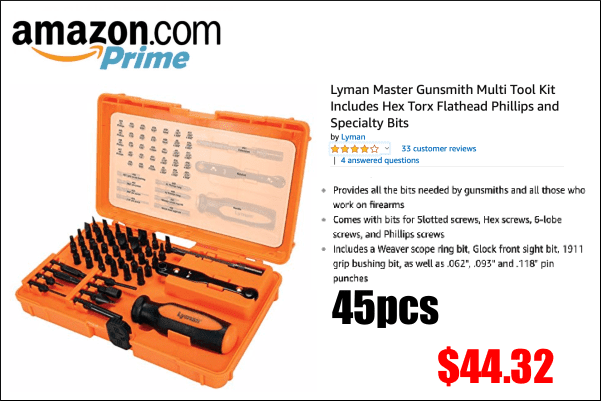 Solve your tool dilemma with the Lyman Master Gunsmith Tool Kit. This handy kit includes nearly all the common sizes and shapes to fit just about anything in your gun safe, all in a convenient case. Cleaning rods are a way of life for anyone who shoots. No matter the caliber or brand, every gun needs to be cleaned and using quality rods will help prevent your barrel from being damaged. Most cleaning rods on the market using metals that can react with your cleaning solvent causing false readings on your patches. 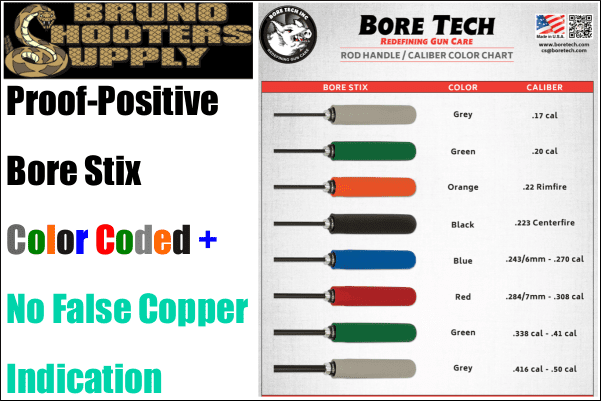 Bore Tech has solved that problem by using a non-reactive tip ensuring that copper shows up if you have it and doesn’t if you don’t. These Bore Tech rods are very stron and feature one of the best ball-bearing handles, which provides a smooth motion that really lets you feel the barrel. You can get the excellent Bore Tech Proof Positive cleaning rods from Bruno Shooters Supply and treat your barrels to a new level of care. Show up to any range and .308 Win is still one of the most prolific rounds available, for good reason. The .308 Win is good for both hunting and target shooting and you’ll get excellent barrel life. In the .308 Win world, a top ammo brand is Federal. 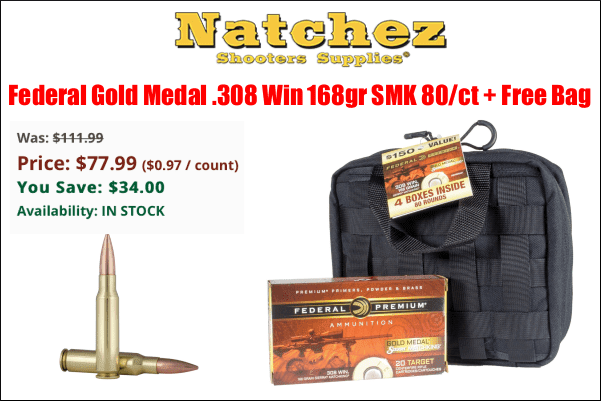 Right now Natchez offers 80 rounds (four 20rd boxes) of Federal Gold Medal Match 168gr SMK along with a FREE range bag for the sale price of $84.99. We’ve shot this ammo and it delivered outstanding accuracy in an M1A and a bolt gun. 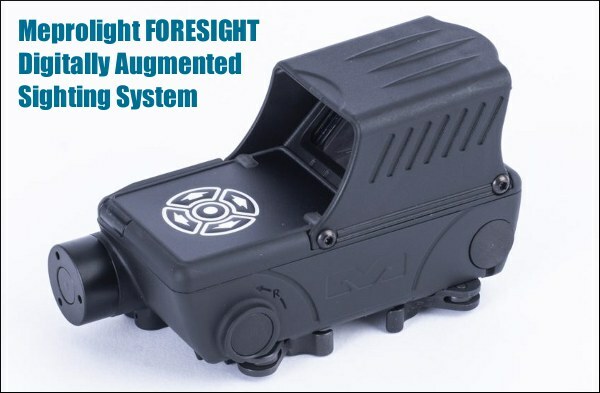 Steiner is a quality optics brand with practical features. 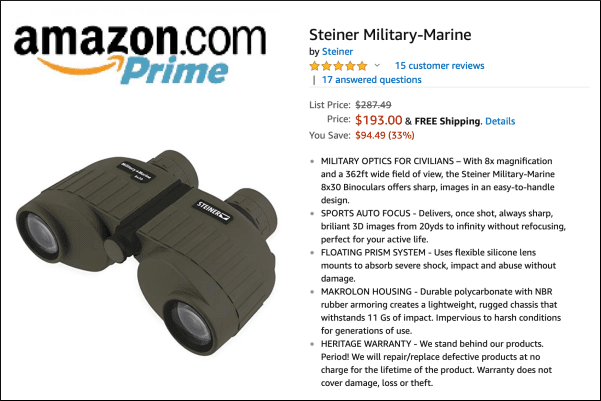 The very popular, highly-rated Steiner 8x30mm Military-Marine binoculars are now on sale for just $193.00. With 8x magnification, the Steiner Military-Marine 8×30 binoculars are a rugged design with a unique focus system that puts everything from 20 yards to infinity in focus. These Steiners use flexible silicone lens mounts to absorb severe shock, impact and abuse without damage. NBR rubber armoring shields a lightweight, rugged chassis that withstands 11 Gs of impact. Your Editor personally owns and uses the Steiner Military-Marine. 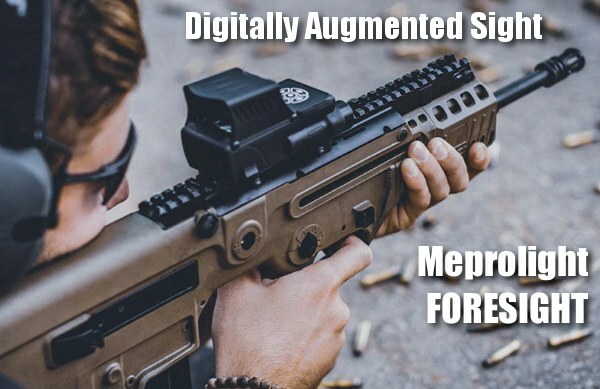 The glass is excellent considering the price, and the focus system is a huge advantage — once you set the individual eye-pieces, no fiddling with focus knobs required — everything beyond 20 yards is sharp. Share the post "Bargain Finder 175: AccurateShooter’s Deals of the Week"
The U.S. Army Marksmanship Unit publishes reloading “how-to” articles on the USAMU Facebook page. One Wednesday “Handloading Hump Day” post covered preparation of once-fired 5.56x45mm brass. This article, the first in a 3-part series, has many useful tips. If you shoot a rifle chambered in .223 Rem or 5.56x45mm, this article is worth reading. And visit the USAMU Facebook page for other hand-loading tips. This week, Handloading Hump-Day will answer a special request from several competitive shooters in Alaska. They asked about procedures for morphing once-fired GI 5.56mm brass into accurate match brass for NRA High Power Rifle use. The USAMU has used virgin Lake City (LC) 5.56 brass to win National Championships and set National Records for many years. In this 3-part series, we’ll share techniques proven to wring match-winning accuracy from combat-grade brass. Assuming our readers will be getting brass once-fired as received from surplus dealers, the following steps can help process the low-cost raw material into reliably accurate components. First, clean the brass of any dirt/mud/debris, if applicable. Depending on the brass’s condition, washing it in a soap solution followed by a thorough rinsing may help. [This step also extends the life of the tumbling media.] Approaches range from low-tech, using gallon jugs 1/2 full of water/dish soap plus brass and shaking vigorously, to more high-tech, expensive and time-consuming methods. When applying the final cleaning/polish, some use tumblers with liquid cleaning media and stainless steel pins for a brilliant shine inside and out, while others take the traditional vibratory tumbler/ground media approach. Degree of case shine is purely personal preference, but the key issue is simple cleanliness to avoid scratching ones’ dies. 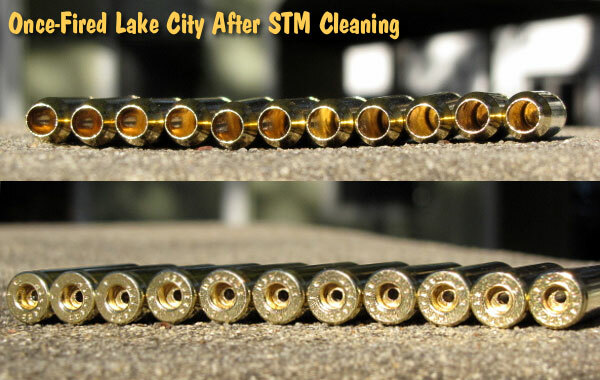 Shown below are Lake City cases after cleaning with Stainless Media (STM). Note: STM Case cleaning was done by a third party, not the USAMU, which does not endorse any particular cleaning method. If a liquid cleaner is used, be SURE to dry the cases thoroughly to preclude corrosion inside. One method is to dump the wet brass into an old pillow case, then tilt it left/right so the cases re-orient themselves while shifting from corner to corner. Several repetitions, pausing at each corner until water stops draining, will remove most water. They can then be left to air-dry on a towel, or can be dried in a warm (150° F-200° F max) oven for a few minutes to speed evaporation. Once dry, inspect each case for significant deformation (i.e., someone stepped on it), damaged mouths/necks and case head/rim damage. Some rifles’ ejectors actually dig small chunks of brass out of the case head — obviously, not ideal for precision shooting. Similarly, some extractors can bend the case rims so badly that distortion is visible when spinning them in one’s fingers. These can be used for plinking, but our match brass should have straight, undamaged rims. Dented case mouths are common, and these can easily be rounded using a conical, tapered tool, [such as a .223 expander mandrel. A dummy 7.62 or .30-06 cartridge with a FMJ spitzer can also work.] If most of your brass is of one headstamp, this is a good time to cull out any odd cases. Your clean, dry and inspected brass is now ready for full-length sizing, decapping and re-priming. Historically, primer crimps on GI brass have caused some head-scratching (and vile language) among handloaders. Our next installment will detail efficient, easy and practical methods to remove primer crimp, plus other useful handloading tips. Until next week, Good Shooting! NOTE: The USAMU Handloading (HL) Shop does not RE-load fired 5.56 brass. We use virgin LC brass with our chosen primer already staked in place. However, our staff has extensive personal experience reloading GI brass for competition, which will supplement the Shop’s customary steps. In handloading, as in life, there are many ways to accomplish any given task. Our suggestions are note presented as the “only way,” by any means. Time for loading/practicing is always at a premium. Readers who have more efficient, alternative methods that maintain top accuracy are invited to share them here. 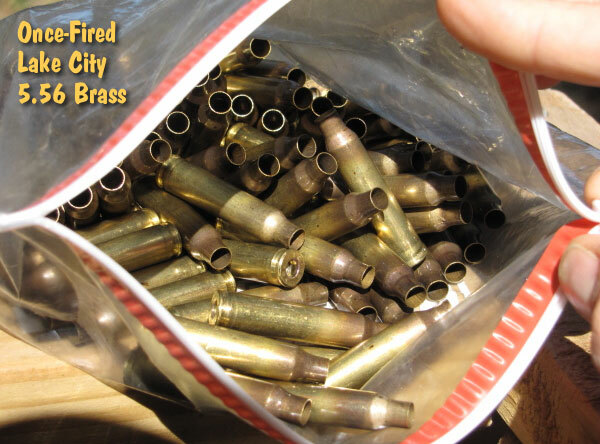 Share the post "How to Prep Mil-Surp Once-Fired Brass"